Although not as controversial as the Space Force, the Space Development Agency has caused internal friction in the Pentagon because it could disrupt current organizations and lead to a redistribution of military space dollars. WASHINGTON — Acting Defense Secretary Patrick Shanahan is moving to set up a new Pentagon agency to oversee the development of military space technology. The Space Development Agency will be under the “authority, direction and control” of Undersecretary of Defense for Research and Engineering Michael Griffin, Shanahan wrote in a memo. Shanahan has directed Griffin to submit a plan by March 1 to stand up the Space Development Agency no later than March 29, according to a Jan. 19 memo titled “Implementation Guidance for the Establishment of the Space Development Agency.” The existence of the memo was first reported Wednesday by the publication Inside Defense. A copy of the memo was reviewed by SpaceNews. While the Space Development Agency would be under Griffin, Shanahan’s memo takes into account the possibility that the agency could in the future be moved into the Space Force if the new branch comes to fruition. In his plan, Griffin has to “address the eventual transition of SDA to the U.S. Space Force after approved by Congress,” the memo said. The Trump administration in February intends to submit to Congress a proposal to establish a Space Force as a separate branch. But it’s unclear how long it will take for the legislation to get through Congress, or even whether Congress will go along with the proposal at all. The Pentagon, however, does not need legislation to stand up the Space Development Agency. Shanahan has insisted that the Space Development Agency is an urgent priority and wants it to be up and running this year. Griffin in December enlisted Fred Kennedy, director of the Defense Advanced Research Projects Agency’s Tactical Technology Office, to lead a study on how the Space Development Agency could be structured. A DARPA spokesman said he could not comment on the status of the study. Although not as controversial as the Space Force, the Space Development Agency has caused internal friction in the Pentagon because it could disrupt current organizations and lead to a redistribution of military space dollars. Most of the military space research, development and procurement dollars are in the Air Force’s budget. Sources said the Space Development Agency would not be seizing control of big-ticket space programs that the Air Force oversees but it would have a say in developing the broad “architectures” of future space systems, for example, and would focus on “systems engineering” so commercial technologies can be more easily integrated into military programs. Shanahan in a Sept. 10 memo asked Griffin and Air Force Secretary Heather Wilson to submit separate proposals for how to create a Space Development Agency. 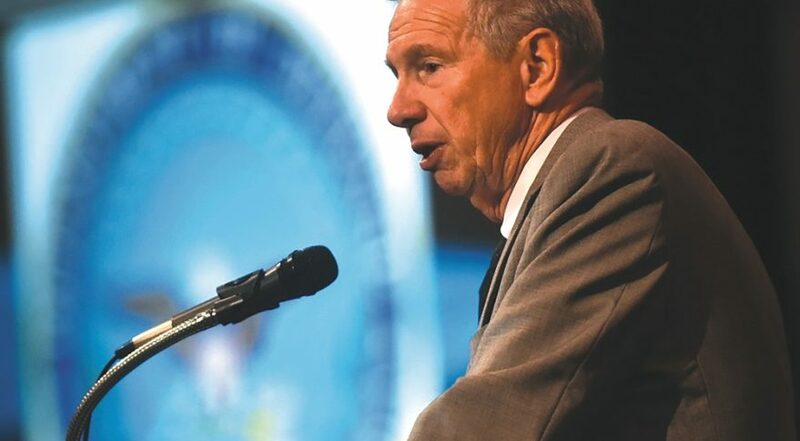 Wilson suggested it should be organized under existing structures, such as the Space Rapid Capabilities Office, and cautioned that a separate Pentagon agency would create inefficiency and would be disconnected from space operators in the field. But Griffin and Shanahan believe that a Pentagon-based agency would be more effective at consolidating space technology efforts now spread across the military services. They have argued that a centralized organization also would help to drive change in procurement practices. Since he was sworn in as undersecretary of defense for research and engineering in February 2018, Griffin has been a frequent critic of the slow pace and high cost of military technology developments. He has voiced frustration about the Air Force’s bias toward “exquisite” satellites that take years to develop and cost hundreds of millions of dollars. He wants DoD to grab technologies from the commercial space industry and quickly inject them into military systems. “To disrupt our adversaries’ calculus in the space domain and deter aggression, we must first disrupt our own space community’s risk-averse culture — by relearning how to build, deploy, operate and innovate rapidly, at low cost,” Griffin wrote in October in his original proposal. Griffin made the case for placing the Space Development Agency in his portfolio so it can collaborate with the other agencies that Griffin oversees and do space-related work — the Missile Defense Agency, the Defense Advanced Research Projects Agency, the Strategic Capabilities Office and the Silicon Valley-based Defense Innovation Unit. Since the Space Development Agency first entered the conversation six months ago, it has drawn its share of detractors. Critics privately have said they are perplexed by the idea of standing up a separate organization to do the work that already is being done by others across the Defense Department. “There has been no explanation of how a Space Development Agency would be value-added over any current acquisition organization,” a defense official told SpaceNews on condition of anonymity because of the sensitivity of the subject. Rather than a new acquisition organization, he said, what the Pentagon needs are “better business practices” that would benefit all programs.